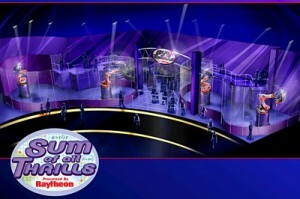 Yesterday, Raytheon Company unveiled the Sum of all ThrillsTM at INNOVENTIONS at Epcot at the Walt Disney World Resort. This new ride is a unique experience that lets park guests custom-design their own thrill ride using mathematical tools, an innovative touch-screen table and a robotic simulator. It is the first ride to be located within INNOVENTIONS and is meant to inspire young students about the power of math and math-related activities. Interactive and customizable, Sum of all Thrills lets guests of all ages create their own experience by first choosing a ride theme, including a roller coaster, bobsled or jet plane. Using multi-touch, object recognition tables with instructions available in six languages, guests use math and engineering-based tools, such as rulers and speed dials, to design and customize their ride by adding corkscrews, inversions or steep hills. Guests learn and apply mathematical and engineering principles to determine how much energy is needed for a jet to take off or for a roller coaster or bobsled to make it up its first climb. When the design of the ride is complete, it is saved on a personal card with a unique bar code. The card is then used to allow each guest to experience his or her custom ride from beginning to end on the robotic KUKA RoboSim 4-D simulator. Inside the simulator, guests experience their ride on immersive high definition video combined with stereo sound and controlled air motion for a complete sensory experience. The KUKA RoboSim 4-D simulator creates a four-dimensional experience through 3-D robotic motion and “wind” that controls air movement to stimulate the senses, providing a more realistic simulation experience. “This immersive experience, our first-ever INNOVENTIONS ride, will inspire young guests to embrace math and science and the important role these subjects play in our lives,” said Dan Cockerell, vice president of Epcot. In addition to the experience at INNOVENTIONS at Epcot, Raytheon launched a virtual Sum of all Thrills experience online at MathMovesU.com. The Sum of all Thrills world, aimed at middle school students, combines the three ride elements of the theme park experience into one multidimensional ride. Students answer math-related questions to unlock elements that enable them to build their own ride online. NOTE: The MathMovesU website uses Flash and may take awhile to load. Do You Like Horror Happenings?